Drawing a realistic object begins with the understanding of how we visually perceive light and shadow and how these two work together to give us the sense of three-dimensional form. We can look at how light interacts with form and identify several distinct characteristics that appear in the scene. It is through light and shadow that we see form or the three dimensional representation of both the shape and volume of the object. We use this visual information created from the interplay of light and shadow on an object to understand the shape, size, and mass of that object. This is because light behaves consistently affecting very object in the same way, creating consistent patterns on the object. Our brains then interpret that pattern into the three-dimensional form. Once we identify these characteristics we can use some basic principles as a guide to illustrate form realistically. 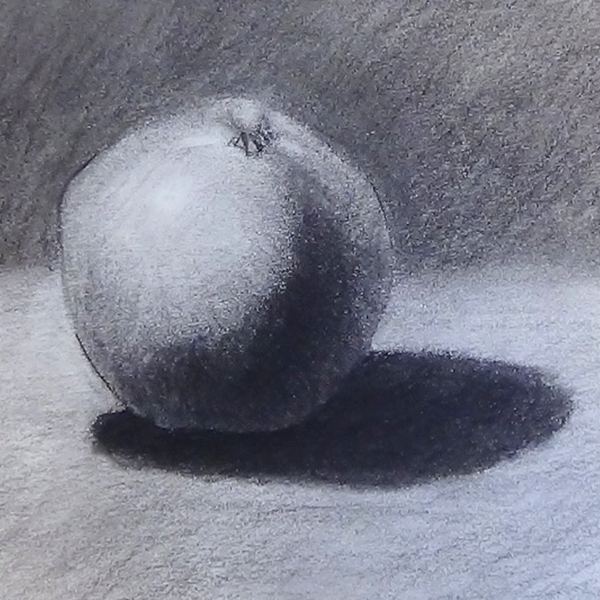 If you understand how the light behaves then drawing a realistic object becomes easier. Lets look at the different elements or part of the light patterns on form. We are going to look at the different elements of light and shadow on a basic form. This will allow us to see these elements more easily. Once you are able identify and draw the different parts it will become easier to do so on more complex objects. The form we will use here is a sphere. In later tutorials we will look at other basic forms (cube, cylinder, and cone) to see how the contour of the form changes the look of the elements of light. To the right is a sphere with all the light elements removed. Notice that it is just a circle, a flat shape. It is the light and shadow pattern that allows us to see its three dimensional form, moving it away from the shape. Here are the shadow elements. Here you can see the two types of shadow, the cast shadow and the form shadow. The area of the object that is behind the surface obstructing or blocking the light is now in shadow. The shadow side of the body of and object is what we call the form shadow. This area is hidden from the light source by the other surfaces of the object. The other type of shadow is one that is created by the object blocking the light from reaching other surfaces. This creates a shadow on the surface area behind it. This is called the cast shadow. 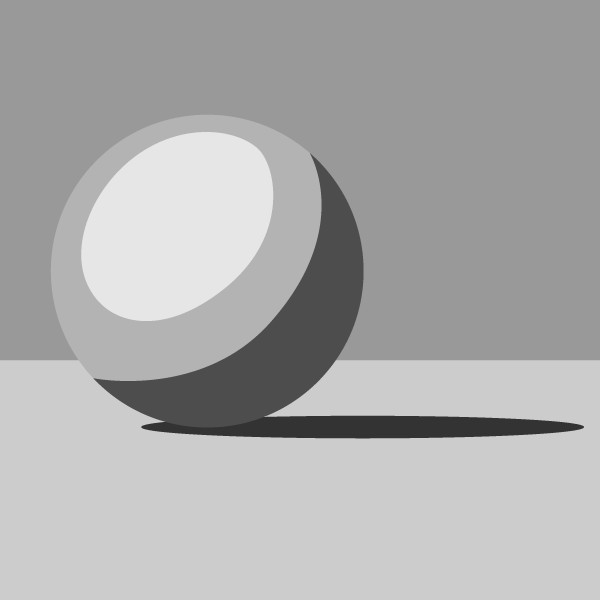 In this example, the sphere casts a shadow onto the area of ground behind where the sphere rests. Let's look at the light side of the sphere. Here we have separated the lighter areas from the mid-tones. The darkest part of the light side of the object is called the mid-tones or middle tone area. This is the transition area between the light side and shadow side of the object. This means that the area that is closest to the form shadow is consistently the mid tone area. Other areas in the light are may have mid tones as well, just remember the mid-tone is used to transition into shadow. Without it, the transition will be too abrubt. 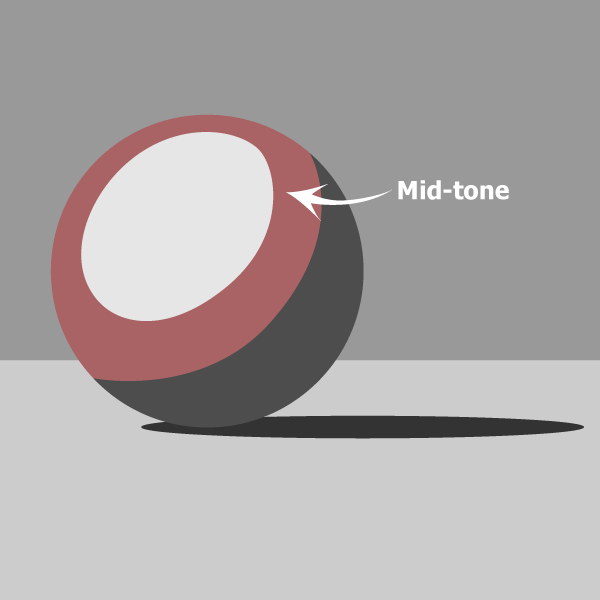 Mid tone: The area on the light side of the object that is receiving the least amount of light. This area is the transition area from light into shadow. The brightest part of the object is called the highlight. This is where the most light is being reflected of the surface toward the viewer. How bright the highlight appears depends on how bright the light hitting the surface is or how reflective the object is. Sometime there may be a strong highlight, sometimes the highlight will be weak. Highlight: The area reflecting the most light within the light area. The from shadow then is not a single shade; it is actually made up of different shades. Inside the shadows you will see the effects of reflected light. As mentioned earlier when the path of the light is interrupted it is reflected. When reflected, the light bounces off of the surface in many directions, back towards the light source, towards the viewer (allowing us to see the object), and towards other surfaces to be reflected again. In this example the light is bouncing off of the ground back onto the sphere. The dark band that we see near the edge of the shadow near the mid-tones is the core shadow. The area of the form shadow that is least affected by the reflective light. This area will appear darkest within the shadow. The core shadow is just the area of shadow that is receiving the least amount of reflective light. Core Shadow: The light that is hitting the object but does not come from the initial light source. Rather it has bounced off of another surface back into the object. So far we have only seen the elements illustrated in a simple graphic. Let's look at a more realistic example. To the right, you can see how the sphere would look in reality. 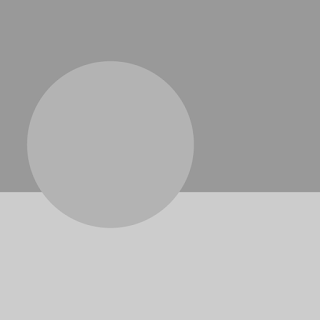 The edges of most of the elements now appear softer, causing the sphere to appear three-dimensional. Below you can see each element highlighted as it would look rendered. Here, the form shadow is highlighted. Here, the cast shadow is highlighted. Here, the core of the form shadow is highlighted. Here, the mid-tones are highlighted. Here, the light area is highlighted. Here, the highlight is highlighted. Now, that you have identified the different elements of light, lets see how to draw sphere using these elements. Cast Shadow: The shadow area created on the surface behind the object block the path of the light. Core shadow: The area of the form shadow that is least affected by the reflective light. This area will appear darkest within the shadow. Form: The three dimensional representation of both the shape and volume of the object. Form Shadow: The shadow side of the body of and object, this area is hidden from the light source by the other surfaces of the object. Reflected light: The light that is hitting the object but does not come from the initial light source. Rather it has bounced off of another surface back into the object. Shape: The dimensions of the object in two dimensions.